Here Are The People Known To Be Targeted In The Package Attacks Authorities say a Florida man arrested on Friday intended to threaten and harm a number of prominent Democrats or liberals with a wave of improvised explosive devices. There may be more. 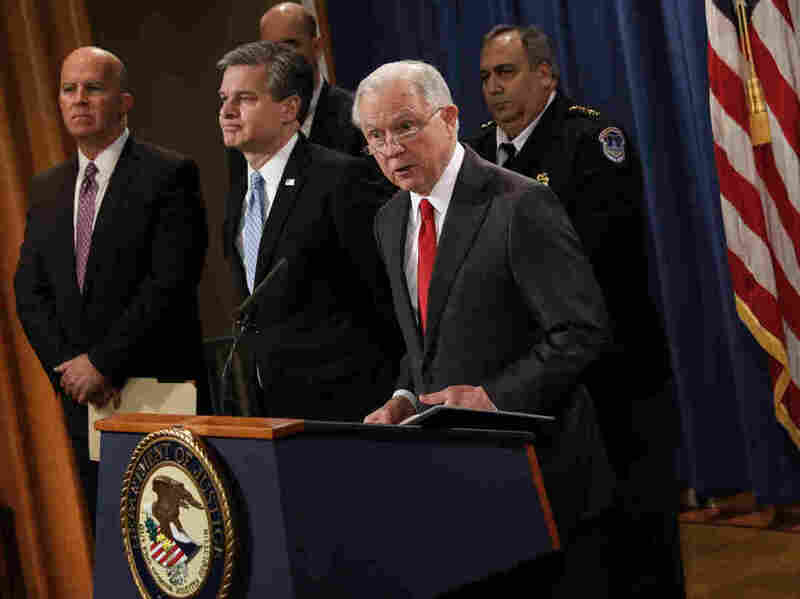 Attorney General Jeff Sessions speaks at a press conference about the apprehension of a suspect in the recent spate of mail bombings at the Department of Justice on October 26, 2018 in Washington, DC. The man arrested Friday in the suspicious packages case was motivated to threaten and harm at least 13 Americans on the political left, according to a criminal complaint released by the Department of Justice. FBI Director Christopher Wray said the items Sayoc is accused of sending were "not hoax devices," and had the potential to do harm to recipients or others who might have come across them in the mail. Sayoc's targets shared one common thread: they are all are all active in politics, and are prominent critics of President Trump. Liberal billionaire George Soros. His Open Society Foundations has given support to NPR. Former Democratic National Committee Rep. Debbie Wasserman Schultz was listed as the return address on many of the suspicious package. The criminal complaint unsealed on Friday lists her as a target. At least one parcel was rerouted to Wasserman Schultz's office in Sunrise, Fla. Billionaire donor Tom Steyer, who is sponsoring a campaign to impeach Trump. The FBI confirmed Friday evening that a parcel was sent to Steyer. He is not one of those mentioned in the criminal complaint. The FBI has acknowledged there may be more improvised explosive devices still moving through the mail toward other targets that haven't yet arrived. Sayoc appears to have been a strong Trump supporter. Federal authorities demurred, however, from establishing a solid political motive for the alleged attacks because investigators are still looking into the case. "He may have been a partisan," said Attorney General Jeff Sessions. "[He] appears to be a partisan, but that will be determined as the case goes forward." Brennan, one of the intended recipients of the IED mailings, was defiant and called on the president to take responsibility for his rhetorical tone. "Your critics will not be intimidated into silence," Brennan wrote on Twitter. "Stop blaming others. Look in the mirror. Your inflammatory rhetoric, insults, lies, & encouragement of physical violence are disgraceful. Clean up your act ... try to act presidential. The American people deserve much better." Waters said this week she would not be intimidated. "I ain't scared," said Waters in an interview with Blavity, a media outlet aimed at black millennials. "The president of the United States has been dog-whistling to his constituency ... I think they are acting in a way that they think the president wants them to do and the way he wants them to act." Trump called for a cooling of political rhetoric as he also praised law enforcement for the arrest. "We must show the world we are united together in peace and love and harmony as fellow American citizens," he said Friday afternoon. But in a tweet earlier that day, the president also used sarcasm quotes around the word "bomb." Trump has also blamed the press, writing on Twitter that "a very big part of the Anger we see today in our society is caused by the purposely false and inaccurate reporting of the Mainstream Media that I refer to as Fake News." Asked by reporters Friday evening if he would phone the targets of the mailings, the president responded, "I think we'll probably pass." An earlier version of this article incorrectly identified Maxine Waters as a Republican.